I read this book some time ago and I highly recommend it. I'm going to be teaching at the DKC Frolic soon so this topic is timely for anyone taking classes. 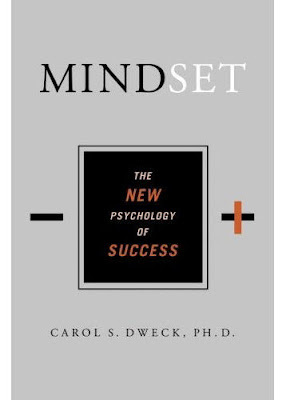 Carol Dweck says on her website: "In a fixed mindset, people believe their basic qualities, like their intelligence or talent, are simply fixed traits. They spend their time documenting their intelligence or talent instead of developing them. They also believe that talent alone creates success—without effort. They’re wrong. In a growth mindset, people believe that their most basic abilities can be developed through dedication and hard work—brains and talent are just the starting point. This view creates a love of learning and a resilience that is essential for great accomplishment. Virtually all great people have had these qualities." I've realized that I fall clearly into the growth mindset. I'm always confident in my ability to learn and enjoy setting challenges for myself. I'm naturally curious and find myself playing the "What if game" whenever I'm swatching with a new yarn or stitch. I have also found in this past year that identifying my weaknesses has led to more growth in every area that I have pursued. I'm getting faster and better with the challenges I set myself in everything from public speaking to charting my designs and developing new ideas. At the same time I continue to search for ways to improve. In other words, practice, practice, practice! I think the difference for those that benefit from taking classes is that good learners make lots of mistakes, the same as poor learners do. However they have the ability to learn from their mistakes because they understand the advantage and don't waste time berating themselves for their failures. They just move on and do better on the next attempt.